Campbell celebrate their victory. Picture: Robbie Cooper. Holders Campbell are through to the Danske Bank Schools' Cup final after a thrilling 12-10 win over Royal School Armagh. In a repeat of last year's final, Armagh dominated the game but were undone by a late Conor Rankin try, whose successful conversion proved the difference. Armagh kicked two last gasp penalties that could have edged a win but dragged the first inches wide and when the second - always optimistic from the 10 metre line - fell short, it was all over. It was the Campbell defence to thank for keeping Armagh's score down as last year's runners-up put in a performance to be proud of only to come up short. "It's fantastic," said Campbell captain Rex Tinsley. "I'm really looking forward to getting back in two weeks' time. It's fantastic for the boys and the school, there's going to be such a buzz now. "Armagh are a tough opposition. We always knew it was going to be a dogfight and that's what it was. They really pushed us to our limits. We stood strong - the defence was excellent. We have work-ons that our coaches can sort out now hopefully. "I just asked the boys to dig deep and do the basics well. To be fair, they did it." Tinsley, along with the entire Campbell side and support, could barely watch when Armagh's late kicks were lined up. "I wasn't happy. I was getting emotional - I didn't know how it was going to go. I was on one knee at the end," he smiled. Campbell began brightly and took the lead on 11 minutes when a stray pass was seizes upon by Jack Stinson and the Belfast side moved the ball across the pitch to the left wing, where Patrick McAlpine took advantage. Armagh dominated territory for the remainder of the half and got their deserved equalising try just four minutes later, pushing forward for a scrum with several big carries until Jonny Agnew crossed the whitewash. The Campbell defence remained stout until the break but they were finally breached on 48 minutes, just seconds after John Gildea was issued with a yellow card for bringing the maul down illegally. Captain Aaron Woods claimed the line-out from the resulting penalty and Ryan Finlay was able to carry across the whitewash as the maul pushed relentlessly forward. Campbell, however, showed their clinical edge as they stole the lead on a rare foray forward. Conor Rankin first picked a gap in the Armagh defence to run in his side's second try and then held his nerve to kick the conversion that would win the game. Favourites Methodist College take on Wallace High School in the second semi-final tomorrow afternoon. 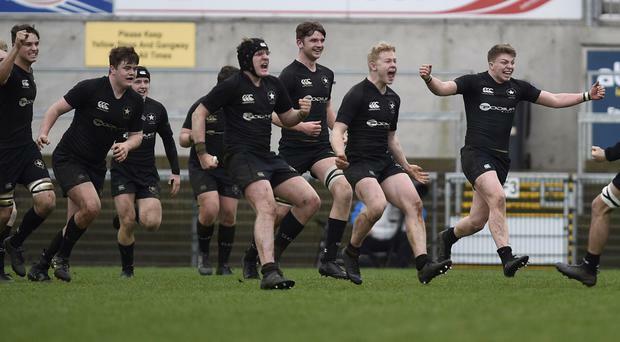 LIVE coverage of the first Danske Bank Ulster Schools' Cup Semi-Final between Campbell College and the Royal School Armagh, with commentary from Paul McIntyre and special guest Darren Cave on co-commentary.